RENO, NV MARCH 29, 2010 – Roger Norman is the pinnacle of the 2010 Mint 400 in his Norman Motorsports Crystal Bay Casino #8 truck. Norman pole positioned, never got passed and seemed no one ever came within 2 minutes in corrected time. “Winning overall coupled with taking the pole position in qualifying makes this an epic event for us,” smiles Norman. When Larry Roeseler took the wheel two laps into the race, he had an 8 minute 22 second lead. “The truck is incredible!” exclaimed Norman. “John Castro, our crew chief, has improved the truck like you wouldn’t believe over the last 2 ½ years. 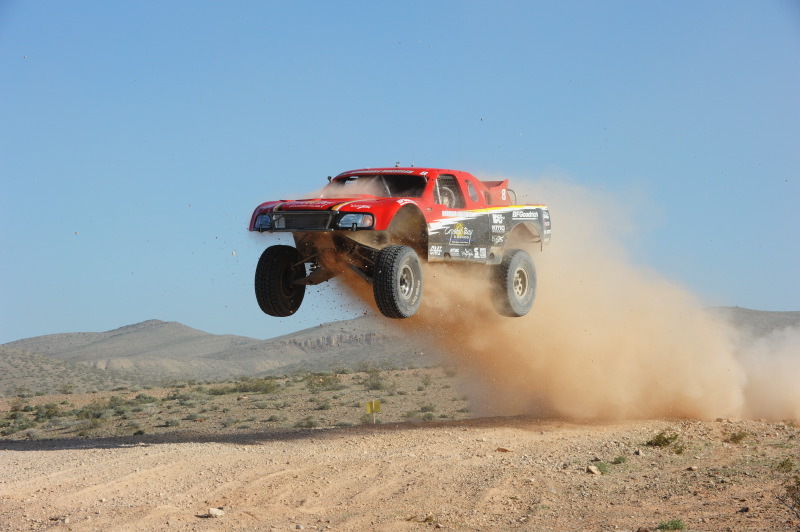 All the tires stay on the ground and you have complete control of the car at higher speeds.” Between the perfect set ups and the Baja Fools three record setting pit stops for fuel and tires, it made the Norman Motorsports team the strongest in the pack. They finished the race in 8 hours, 37 minutes and 29 seconds, a full eleven minutes before Bobby Baldwin, the 2nd place finisher. The course was a brutal 106 mile loop that had to be completed 4 times to finish. There was a lot of carnage, lots of flats, but Norman was really fortunate not to have any problems requiring down time. “The BFGoodrich Baja T/A KR Tires were stronger than the Nevada desert,” said Norman who had no flats on the KMC Wheels. They overcame a few issues during the race including a little drive shaft vibration that seemed to fix itself, the left front shock going out in the last lap, and there seemed to be an oil pressure problem that turned out to be an electrical issue only. Communication was one of the teams main focuses for the weekend. Eric Branstrom co-drove for both Norman and Roeseler and did a fantastic job. The Fire ETC Mobile communications command post was set up at the start finish line and had trucks deployed everywhere that were able to help with timing. “We succeeded at mastering our methods and look forward to applying it to longer more strategically difficult races,” said Norman. “This is a very historical race in the off road community,” said Norman, who’s family was involved in the early days. In 1972, the third year of the race, Norman’s step-father Bill Muncey was the Grand Marshall. The greatest hydroplane racer in history continually told the story about this race and being invited to run a buggy, which he claims was the hardest thing that he had ever done in his life and hoped that no one would ever invite him to race another off road race ever again! “All I have ever heard is how difficult this race is, and now to win it coupled with having my Mom, Fran Muncey, and wife Elise here to support me today makes the celebration just that much better,” said Norman.